Some motorists and villagers have shared their ugly experiences after armed bandits took over the Sokoto-Gusau road. There is mounting tension over the security situation along the Sokoto- Gusau road. Villagers, motorists and passengers have continued to share their ugly experiences following the activities of bandits. Last Tuesday, October 9, 2018, at 2:00pm, it was said that some unknown gunmen attacked travellers at Mashayar Maiki, along Sokoto-Tureta road. A Central Bank of Nigeria, (CBN) driver reportedly died as a result of gunshot injuries sustained during the attack. The police public relations officer, Sokoto State command, DSP Cordelia Nwawe, confirmed the attack. “It was meant to be a robbery attack; fortunately, the police got wind of it and came out en masse and the bandits ran into the bush. Unfortunately, when they were running, there was exchange of gunfire,” she said. She said the CBN driver, who was shot in the process, died while receiving treatment in a hospital, adding that the police were on the trail of the suspected robbers. She further said there had not been any reported case of kidnapping. Speaking on the security situation along the Sokoto-Gusau road, she said that bandits from Zamfara had been making efforts to gain entrance to Sokoto, but the police mounted roadblocks to checkmate their movement. “We do not want what is happening in Zamfara to come into Sokoto. That massive bush area is not our axis. It is Zamfara axis but they want to penetrate Sokoto from there. And we are saying no,” she said, adding that the police have been deployed to fortify that area. “The serene atmosphere in communities along Sokoto-Gusau road is no longer there. This is as a result of frequent attacks by bandits who are living on people’s sweat,” a resident in one of the affected villages lamented. 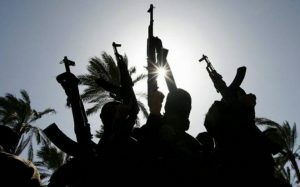 A fortnight ago, at Wababe and Illela villages in Dange Shuni Local Government Area, bandits were alleged to have abducted wives of the Miyetti Allah chairman and one Alhaji Sani, a businessman. They demanded ransom as a condition to release them. Some of the dwellers also alleged that the bandits had informants in the communities where they unleash terror. The villagers identified vulnerable points along the road from Sokoto axis to include Dogon Karfe, Dimasa, Kampanin Diya and Mashayar Maiki. “At all these places, bandits can strike at any time of the day. They shoot at vehicles that defy their orders,” one of the villagers said. It is said the bandits look out for the well-to-do among passengers in any vehicles they intercept. “Anyone without a phone is not considered for abduction. They always reason that without a phone there is no chance of making contact with the relatives of an abducted person for onward negotiation of ransom,” a villager explained. Recently, two housewives, Mallama Balkisu and Mallama Rashida were said to have escaped the bandits’ assault while travelling back to Sokoto from Zamfara State in a commercial vehicle. Narrating their experience, they said that on reaching Lambar Bakura, they met a crowd of people with several vehicles parked and waiting for a signal to commence journey to Sokoto. They were informed that bandits were on operation along the road, stopping commercial vehicles, robbing and abducting passengers. Sokoto, whose relatives paid ransom before they were released. Balkisu and Rashida were lucky to escape the bandits because of their decision to stay at their relative’s house in Bakura until the road was confirmed safe. For fear of possible abduction by the bandits, a Dange-based farmer, with a farmland at Kampanin Diya, stopped his children from carrying out this year’s harvest. He is afraid that the bandits can attack them from their hideouts, which they suspect could be anywhere in the bushes on both sides of the major road. It was observed that from Dimsa to Dogon Karfe and Kamfanin Diya to Mashayar Maiki, which is a stretch of tarred road, is usually deserted as the bandits carry out their nefarious activities there unhindered. Because of the activities of the bandits, local government workers in Tureta also face challenges going to their duty posts. “Scarcity of vehicles and the fear of bandits on the road are the major challenge,” some of them said. It was also observed that for the fear of the unknown, many businessmen who usually went to Talata Mafara every Tuesday have stopped.